Chin Guard Large, 6 1/ 2"
Body Sox Therapeutic Sacks are the Winners of the 1993 Early Childhood Directors' Choice Award, Body Sox will inspire your own Magical Performance! 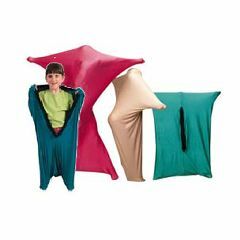 Body Sox are fun, therapeutic sacks constructed from four-way stretch Lycra® with a reinforced hook and loop opening. Body Sox teach both adults and children all about special relationships and gross motor control. Supplies proprioceptive feedback that leads to normalized muscle movements and a new awareness of the body. Translucent, so individuals can see shapes around them. Body Sox are specifically designed for spacial awareness and interaction. Once inside, users find themselves in a private domain that lures them into kinesthetic exploration. As they move their shapes become art-like. They become enraptured as they begin to understand and explore the 3-dimensional space they individually occupy. Body Sox users quickly find out how easily it is to transform space and how balance and coordination affect this transformation. Users of the Body Sox can create dancing images such as rolling rocks, hatching eggs, moving puzzle pieces, birds of flight and more! Body Sox has a hook-and-loop fastener(s) opening and comes in four sizes. Small for User Heights 40" - 46"
Medium for User Heights 47" - 55"
Large for User Heights 56" - 65"
Extra-Large for User Heights 66" - 73"
Sorry but color cannot be specified. Easy To Use. Easy Storage. This IS my son's second body sock he is autistic and has sensory intergration issues. He out grew the first body sock. It is away to get him to get up and move around and it gives him the snug feel He craves IE...such as a hug. Easy To Use. Easy To Setup. Comfortable. Easy Storage. My children use the body sox to help calm themselves down and transition from one activity to another. Easy Storage. Strengthens. Easy To Setup. Easy To Use. Comfortable. Quiet Operation. My 3.5 year old daughter has sensory processing disorder, so I bought her a "body sock" to help her integrate her vestibular and tactile senses through a proprioceptive device such as the body sock. She absolutely LOVES this thing. She really enjoys inching on the floor like a caterpillar, and then standing up after she has become a butterfly and flaps her "wings". The feedback she recieves from moving around the house in this sock has helped her make great strides in her gross motor development in a very short period of time. Sturdy. Comfortable. Daughter likes it. Easy To Use. Easy Storage. Adult must help close it. Great for kids who need sensory input of weight or feedback from pressure. It really helps calm our hyper daughter. Only con is she doesn't seem to be able to seal up or open the velcro closure on the front on her own. Otherwise, it's great. She loves the color. How do you clean a 4 way lycra body sox? Are the body sox latex-free? If not, is there a version that is? The body sock is made of lycra. There is no tag inside listing the materials, please contact School Specialty directly. HOW WILL THIS HELP A BROKEN VERTIBRAE? I FELL FLAT ON MT POSTERIOR. WOT DO SURGERY. AGE AND HEART PROBLEMS. I don't believe this is appropriate for your condition. Please consult your physician for alternative treatments.